Our guest speaker was Dr Manu Saunders, post doctoral research fellow on ecosystems with the Institute for Land, Water and Society at Charles Sturt University. Manu spoke about the role of all sorts of pollinators in food growing and agriculture and explained how we can provide a welcoming environment in our own gardens to encourage them to visit. Most crops need pollinators eg almonds, blueberries and sunflowers rely completely on pollinators. Flowers need pollinators. Some plants are wind pollinated. European honey bees are used for commercial pollination. They are easy to please, domesticate and manage but they are also easily distracted. There are about 2,000 species of Australian native bees eg the blue banded bee. Stingless bees pollinate watermelon, macadamia, avocado, lychee, and strawberry plants, but are not native to the Albury-Wodonga area. 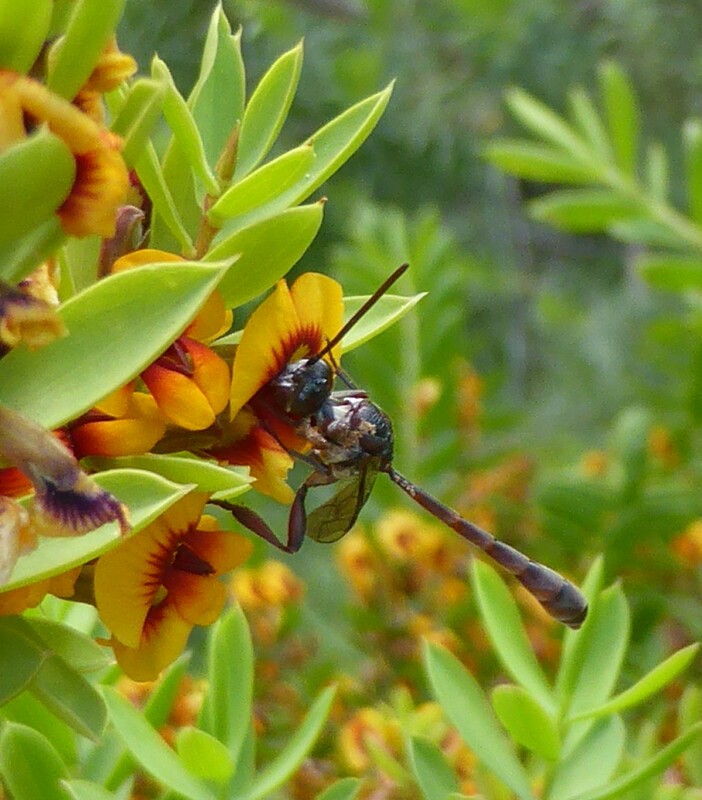 Native bee ‘buzz pollinators’ go for dianella, senna, hibbertia, tomato, potato and eggplant. The 20,000 species of wasps in Australia are pollinators as well as being parasites and predators. Syrphid flies are hoverflies which are dual purpose pollinators being very efficient at pest control. Other flies include sawflies, blowflies which are attracted to smelly flowers. Midges and mosquitoes pollinate cacoa flowers and beeflies. Butterflies and moths can work both day and night as pollinators eg bogong moth. Last but not least beetles are pollinators. A big difference between European honey bees and Aussie native bees is that “less is more” since Aussie bees visit the plant less but they carry around more pollen than the honey bees. Aussie native bees are generally smaller and stay close to where they were born – within a few hundred metres – whereas honey bees can travel kilometres, as can bumble bees, going up to 5 km. Nothing exists in isolation and everything in an ecosystem interacts. Seasons of the weather, type of native vegetation and land use policies all play a role. More bees live near reserves because there are more plants there. The distance the insect has to travel to forage for food, what chemicals have been used in the area and whether the plants are native or exotic. Food and water are essential. Putting out shallow bowls of water really helps especially in summer. Providing a home such as building a bee hotel. Manu created the Wild Pollinator Count, a project that aims to help increase the awareness and information about pollinators in Australia. Anyone can participate, you choose the site and it takes just ten minutes. The next count is happening between 15 and 22 November. More info on the internet at wildpollinatorcount.com. Manu is hoping Seed Savers members will join in (again) and count pollinators in our gardens this year. Many thanks to Victoria for sharing her notes from the night, and yes, we’ll keep everyone posted about the Wild Pollinator Count as November approaches, via this website and our email list. We also appreciate the support of those who attended our AGM, held after Manu’s talk – and conducted in a record-breaking 6 minutes [admittedly with slight adjournment for an unexpected event part way through]. Sincere thanks to both the outgoing and incoming committee members … and a reminder that all members are welcome to attend and/or lend a hand with any aspect of the committee’s role and/or our events. Seed Savers Albury-Wodonga exists and runs events thanks to volunteer time and enthusiasm, and every bit helps!